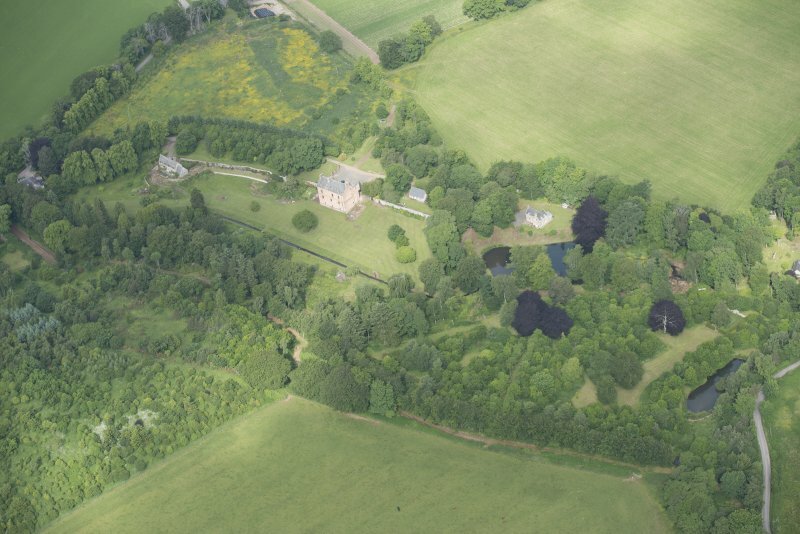 Oblique aerial view of Druminnor Castle and garden, looking to the WNW. Drawing showing NE and NW elevations, Druminnor Castle. 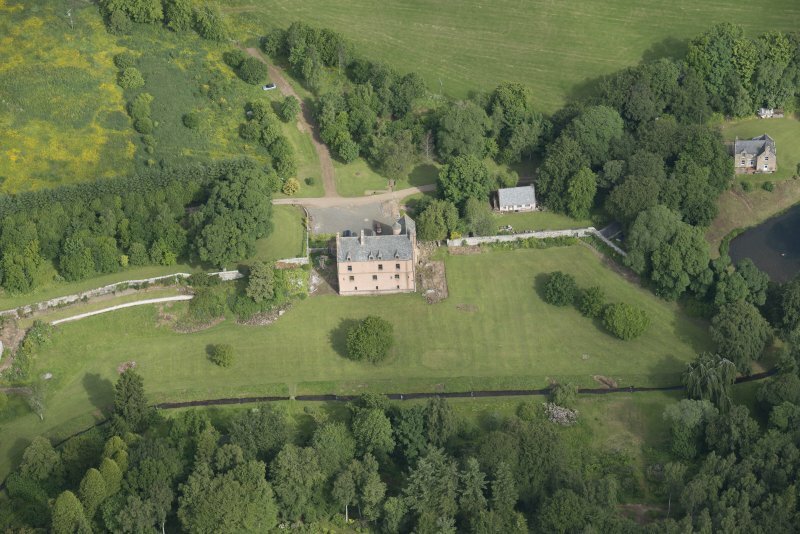 Oblique aerial view of Druminnor Castle and garden, looking to the NW. 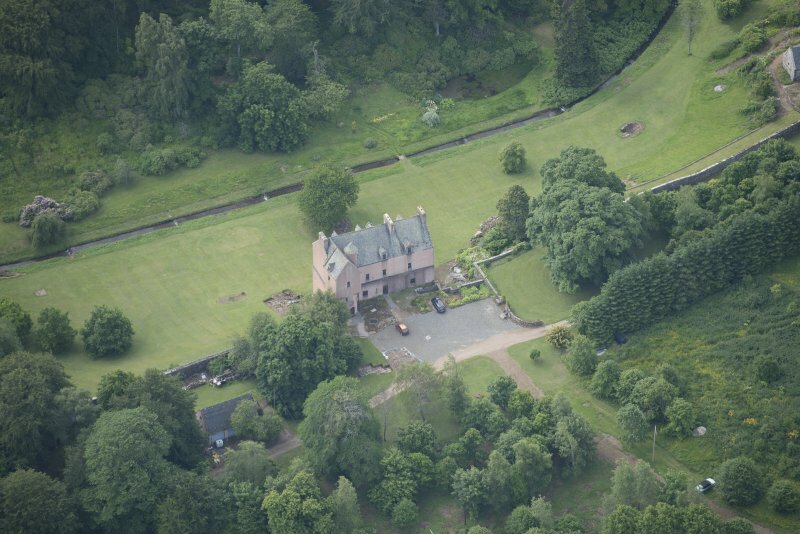 Oblique aerial view of Druminnor Castle and garden, looking to the NNW. 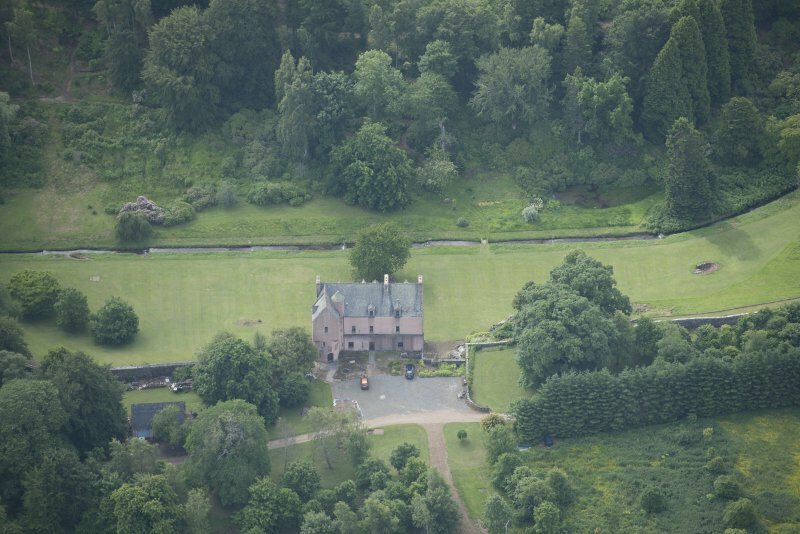 Oblique aerial view centred on the castle, garden, walls, cottage and lodge with the farmsteading adjacent, taken from the E.
Oblique aerial view of Druminnor Castle and garden, looking to the SSE. 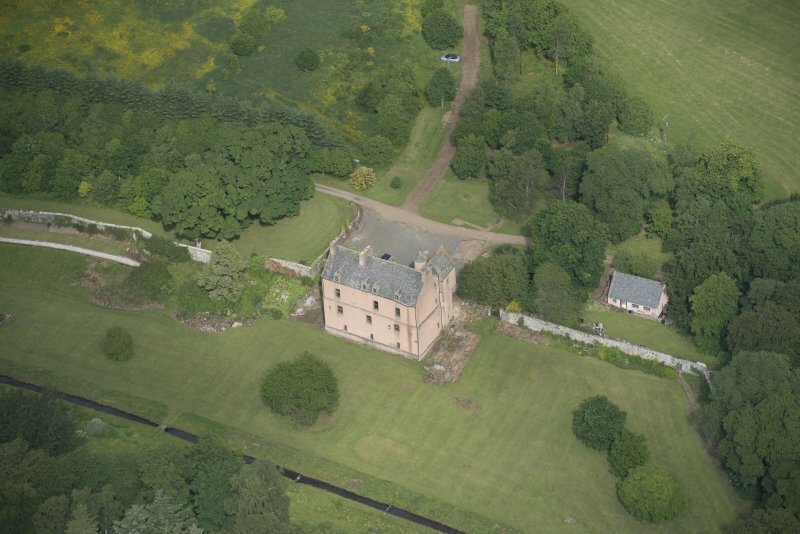 Oblique aerial view of Druminnor Castle, looking to the . 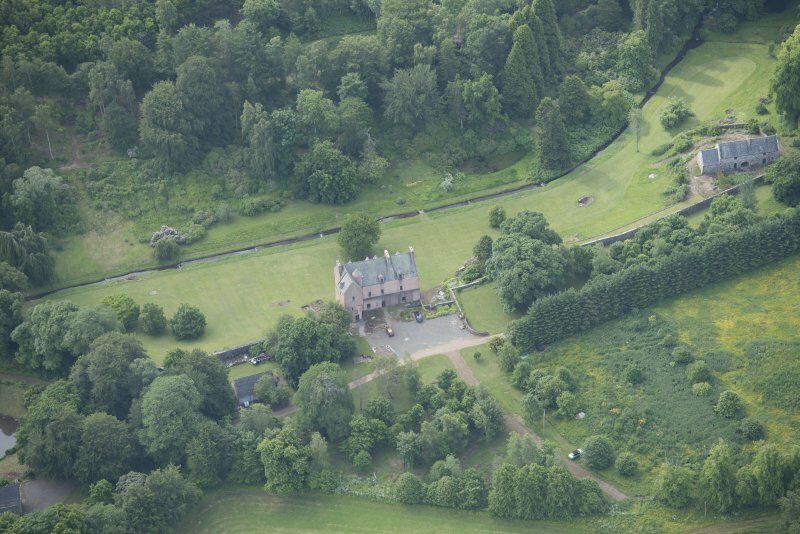 Oblique aerial view centred on the castle, garden, walls, cottage and lodge with the farmsteading adjacent, taken from the SE. Drumminor Castle. View from NE showing older part. 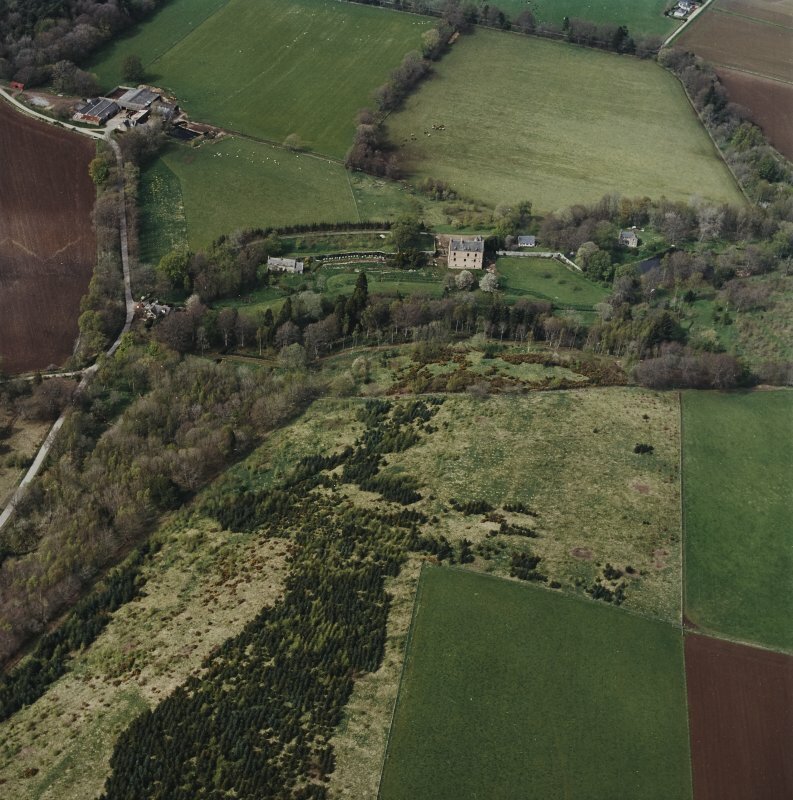 Oblique aerial view centred on the castle, garden, walls, cottage and lodge with the burial-ground and farmsteading adjacent, taken from the ENE. 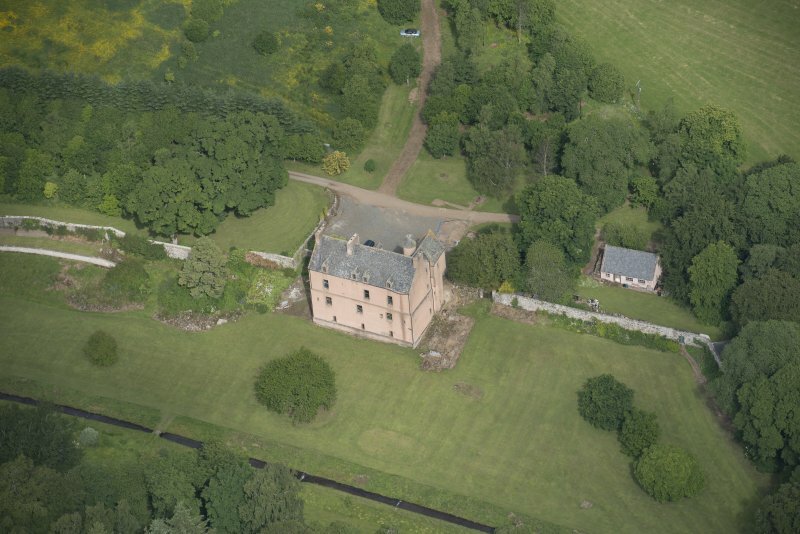 Oblique aerial view of Druminnor Castle, looking to the SE. 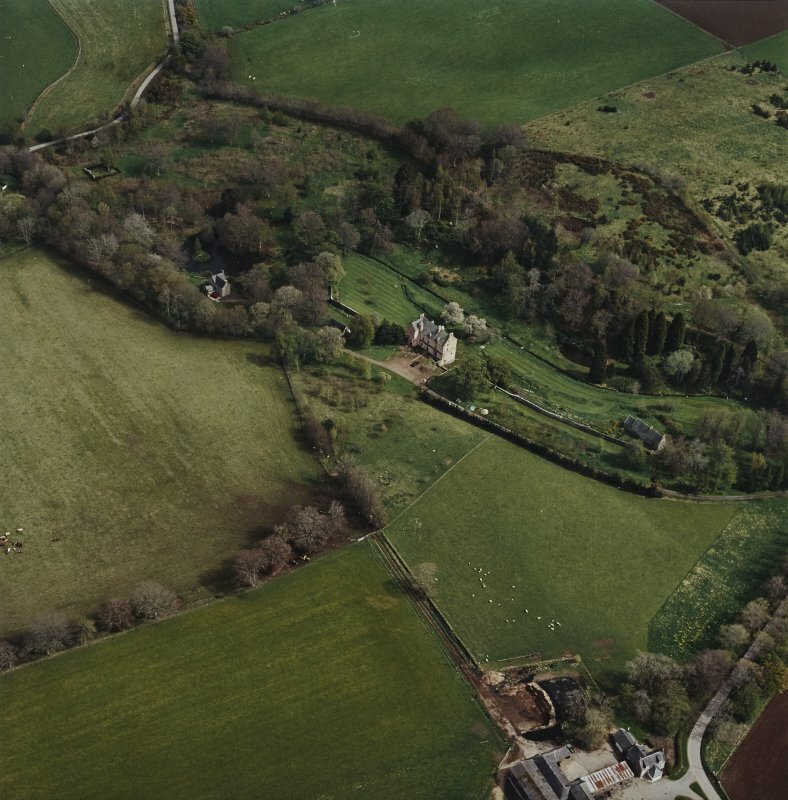 Oblique aerial view centred on the castle, garden, walls and cottage with the burial-ground adjacent, taken from the WNW. entrance is, Huntly-like, in stair-tower at north-east, adorned with three armorial panels over the door. From the courtyard the main block appears subdued but rears up four storeys on the dramatic south front, owing to the fall in the ground. Tiny dormers pierce the wallhead. 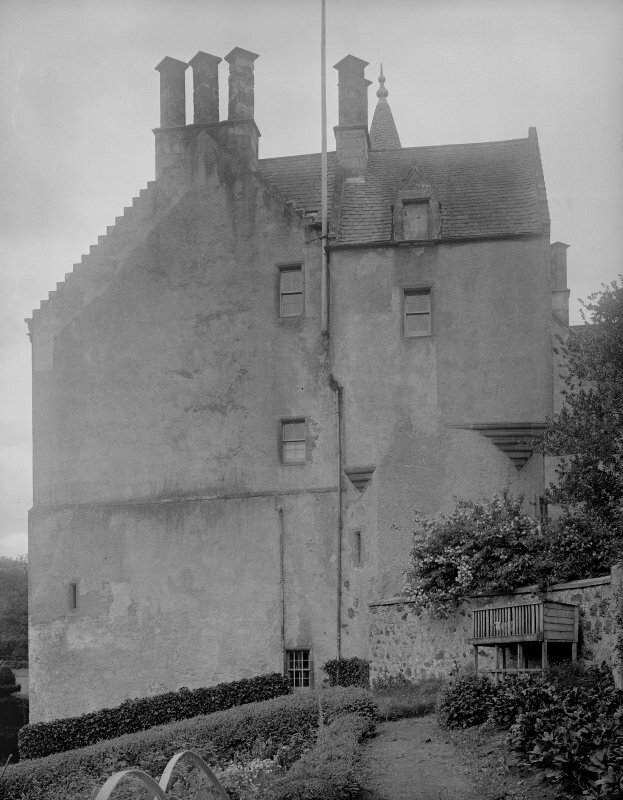 Nothing now remains of Archibald Simpson's wing of 1815 which had dramatic pointed gables and three good dormer-heads; house guests in the 1950s were each invited to remove a stone by the Hon Margaret Forbes Sempill who restored the castle with advice from Ian G Lindsay. rises from the general tenor of the times and the fact that many people thought that there were at least 20 Gordons who would be the better for the letting of a little life out of them! For previous history of Druminnor House and the derivation of its name see NJ52NW 22. The original rectangular keep-tower of Druminnor, built by Alexander, 1st Lord Forbes in 1440 and licensed on May 4th, 1456, still remains basically as it was built. It was slighted after the battle of Tillyangus in 1571 and repaired in 1577, the latter date being cut on a stone above the door arch bearing the arms of William, 7th Lord Forbes - 1547 to 1594 - set in the circular staircase tower which was probably an addition at that time. Attached to the older building is a wing erected in 1815. 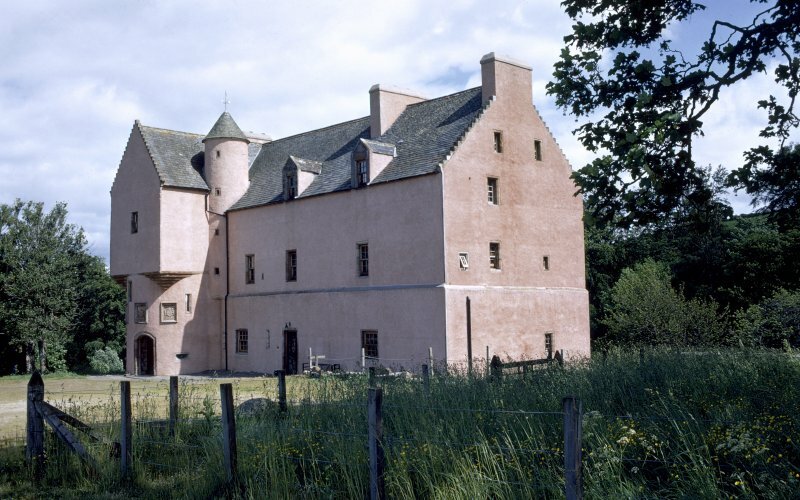 The old castle is being restored to its original state by the owner, Miss Forbes-Sempill. MacGibbon and Ross (1887-92) name it as 'Druminnor Castle'. J F Wyness 1959; W D Simpson 1949; J Leyden 1903; D MacGibbon and T Ross 1887-92. Druminnor Castle, as described and planned by Wyness (1959), has now been restored to its original condition. Visited by OS (RL) 21 September 1967. (Location cited as NJ 5130 2639 and classified as Site of Regional Significance). 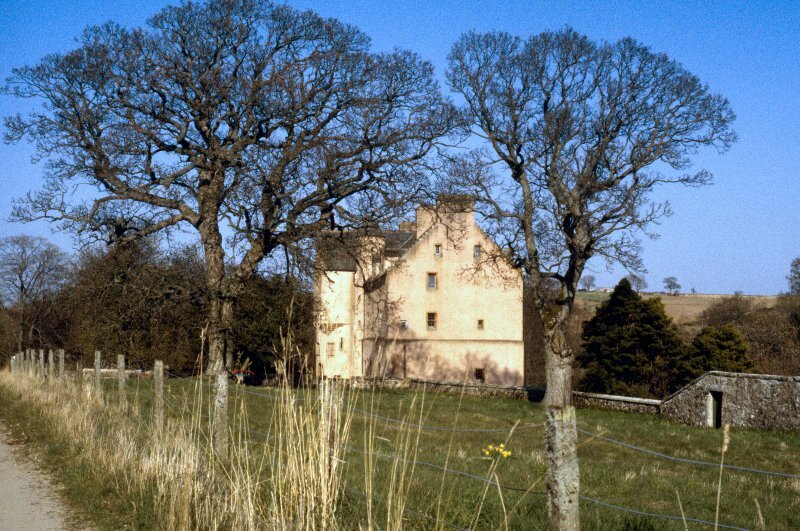 Only the staircase tower and hall block remain of a much larger building, a great palace-house similar to Huntly Castle (NJ54SW 9). The great square tower was demolished in 1800 after which a Baronial villa was built in 1815, which was in its turn demolished in 1960. Only the foundations remain of the extensive courtyard ranges. Now restored to its former condition wherever possible. Masons: John Kemlock and William of Ennerkype, 1440: architect, Archibald Simpson, 1815. Memorandum dated 4 July 1440; livence dated 4 May 1456; sacked 1571; alterations 1577 and 1843. NJ 513 264 A programme of survey and recording was undertaken of the archaeology revealed in a series of trenches. These trenches had already been dug by the owner, with the intention of locating and assessing an extensive system of drains around the castle in the hope that these excavations would provide a solution to recent drainage problems that had been encountered. Initial site inspection showed that a wide range of archaeological features and deposits had been exposed. NJ 5131 2640 Watching briefs were kept during remedial works to combat drainage problems within and around the hall range, which is all that survives above ground of this mid-15th-century castle. This work was a continuation of a project started in 2001 to locate and unblock drains distributed around the castle's exterior (DES 2002, 8). In addition, a large trench was opened at the SW corner of the building to allow it to be strengthened by concrete buttressing. Excavation revealed the massive rubble foundations of the castle and evidence of a sequence of post-glacial processes associated with the nearby Kearn Burn. A small trench was opened to determine whether any remains of a putative tower survived below a 19th-century mansion house that had been built against the NW corner of the castle, but which was demolished in the 1960s. No trace of either building was uncovered. quite possibly a garden terrace wall. At the S end of the trench, near the SE corner of the castle, were the remains of a masonry building, the E wall of which had been thickened at some stage, probably to insert a fireplace. This building, which had a flagged floor, had been truncated by a modern drain on its S side. Excavation within a small cellar in Garden Cottage, some 100m W of the castle, revealed a stone-lined passage in its E wall which defies interpretation. Possible explanations for the cellar include its use as an ice house or as a wheel pit for a mill pre-dating the presumed late 18th-century date for the cottage, although neither idea bears close scrutiny. Non-Guardianship Sites Plan Collection, DC23397, 1963. Photographic survey by the National Buildings Record Scottish Council in May 1954. 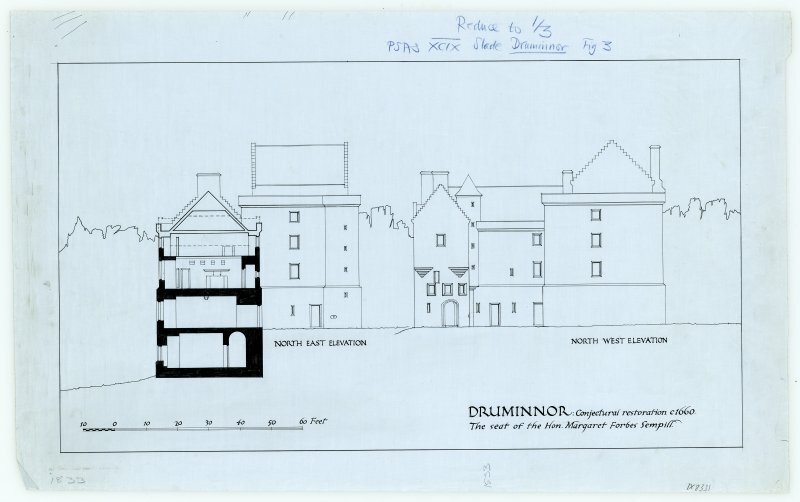 NJ 5131 2642 As part of research into the archaeological potential of the area, an 18th-century estate plan was discovered, that included a block plan of Castle Forbes (now Druminnor) and a simple perspective sketch. Until now, only fleeting documentary references to the pre-1841 layout were known, from which it was deduced that the surviving building was part of a much larger complex, of which the ‘Old Tower’ was the principal element. The ‘Old Tower’ and the Kirk of Kearn were demolished around 1800. A new mansion was added in 1841 and the gardens remodelled. The 1841 building was in turn demolished in the 1960s. The perspective sketch is the only known image of ‘Castle Forbes’ prior to its 1841 renovation. The new plan confirmed that the medieval castle was far larger than the surviving fragment, consisting of two courtyards of buildings within a barmkyn, surrounded by extensive enclosures for gardens, orchards and a ‘cour d’honneur’. The ‘Old Tower’ was clearly not where it had been imagined, but the sketch confirmed that the documentary descriptions of it were broadly accurate. However, inconsistencies between the block plan, the sketch and the actual topography raised as many issues as they resolved. As part of the Bennachie Landscapes community research initiative, the fieldwork group began investigating the former ground plan of Druminnor Castle. Trial trenches were laid out to locate the former wall-lines shown on the late 18th-century estate plans. Unfortunately, many of the earlier land surfaces had been removed during early 19th-century landscaping and rebuilding works. However, the trenches did identify features, in various states of survival, which indicated that further work will clarify the situation. Grateful thanks are extended to Alex Forbes for sharing his historical and architectural knowledge, for his wonderful hospitality and for his great forbearance whilst his gravel car park was indelibly scarred by trenches. NJ 5131 2642 Following the trial trenching reported last year (DES 2013, 15–16) further fieldwork was undertaken, May – October 2014, which has begun to confirm and clarify the ground plan of the 18th-century castle, which was largely demolished in the first half of the 19th century. The work has also begun to record features belonging to earlier phases of activity. These appear to demonstrate a slightly different alignment and plan, though further work is needed to confirm that proposition. This year’s work has demonstrated that more archaeological evidence survives from the castle than was initially suspected. when the hall block was being made more commodious, may be another option. the mid-15th century, but the pottery assemblage noted above tends to confirm that this may not have been the first building on the site, as the name of ‘the Old Tower’, demolished in 1800, implies. Stylistically, the tower might be considered to have belonged to the later 13th or earlier 14th century. construction. A levelling layer of sandstone debris underlies all other archaeological features and overlies the natural basalt bedrock and weathered sandstone subsoil. This layer may, therefore, represent initial levelling for the earliest medieval structures on the site. questions arising from this interesting site. NJ 5131 2642 Three areas were investigated, May – October 2015, in order to clarify elements discovered in previous years (DES 2014, 16) and to try to locate the eastern perimeter wall of the castle plan as shown on two 18th-century estate maps. 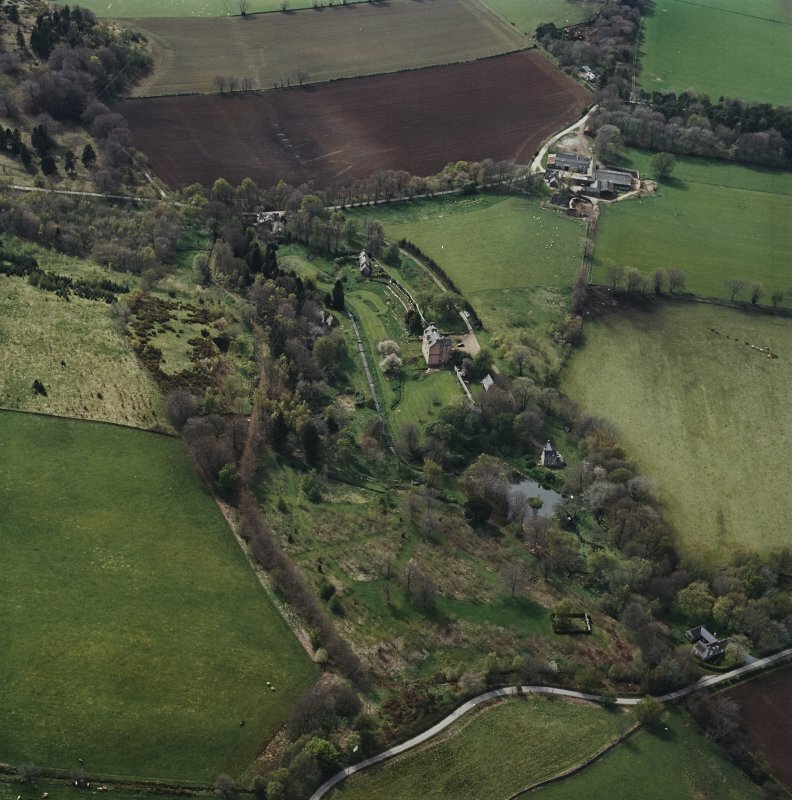 The perimeter wall proved elusive as the area where it is assumed to have stood appears to have undergone sweeping landscape changes in the 19th century; having been cleared to natural and then overlain with topsoil. However, a shallow but well-built minor drainage channel overlain with flat capstones was found at the W end of the trench. This possibly served one of the buildings (shown on the estate maps) lying in the service courtyard. The drain would have run directly across the courtyard, though along an apparently illogical flow-line. The remains discovered N of the castle in 2014 were further investigated. This work demonstrated the survival of a substantial wall comprising an outset foundation course on the downslope side, coursed stonework and a rubble core made of small stones bonded by clay. The wall, measuring c1.2m wide at its base, appears to have been completely robbed out at either end. Abutting the surviving section of wall on its southern (upslope) side is a rectangular structure consisting of a basal outer row of large fieldstones enclosing a platform of clay-bonded rubble and measuring c2.7 x 2m overall. The purpose of this feature is unknown. Beneath this structure, and partially sealed by it, is a stone-lined pit. After heavy rain, this pit retains water and may have acted as a small cistern, though this remains to be confirmed. The wall is presumed to have acted as an outer enclosure for an earlier plan of the castle. Its alignment is out of true with the 18th-century plan (taken from the estate map) and the surviving S range, but lies parallel to other features discovered and with which it may have been contemporary. One of these features is another substantial stone-built structure (described below). A third area was examined in order to elucidate the purpose of remains found at the edge of Trench 2 in 2014. These appeared to be structural features underlying the northern outer enclosure wall shown on the estate map. Once revealed, these related to the corner of a substantial building consisting of an outset foundation course, coursed stonework and a mortared rubble core. The structure’s wall measures c1.2m across its outset foundation course. This building appears to be one of those shown on the estate map. However, the northern enclosure wall linking this structure to the rest of the castle plan was feeble in comparison with this, presumably earlier, building and merely abutted it at a level much higher than the foundation course. Furthermore, the building appears to be aligned askew to the later castle plan, but to share its orientation with the wall noted above and a drain/path feature noted in earlier phases of the excavations. 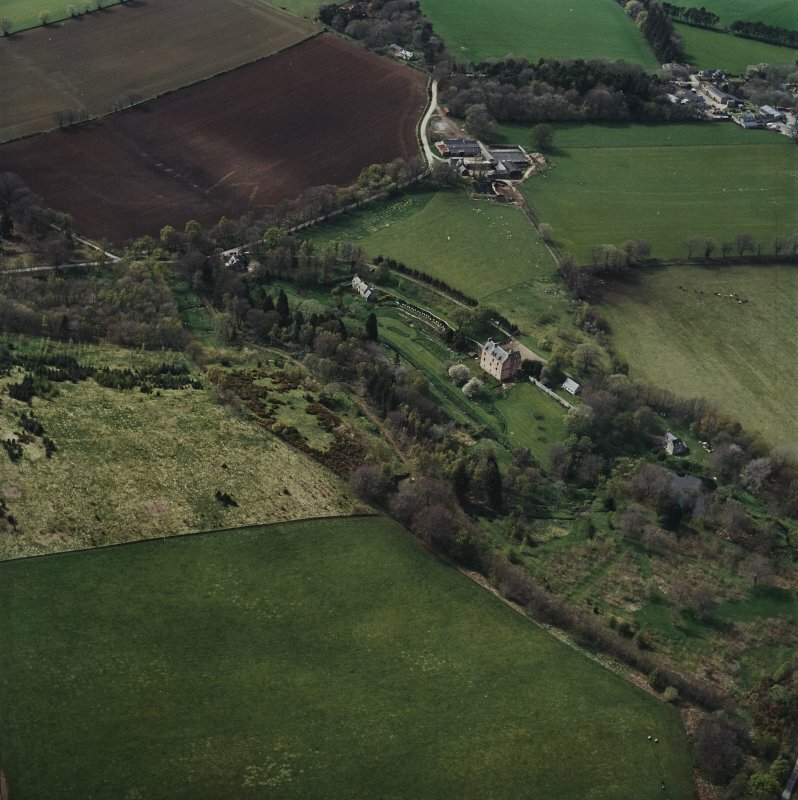 It might be suggested that the later plan, shown on the estate map and assumed to belong to the 17th century, was created by joining older extant features; the substantial building described here being one of those earlier features. A number of dressed stones, complete and fragmentary (see below), have been found as backfill components in this area; this contrasts noticeably with other areas of the excavation. A doorway, in the corner of the building, poses certain difficulties with regard to its construction and may be a secondary feature. Various pottery sherds, dated to between the 14th and 16th centuries, were found overlying the building and the wall described here, but none in securely stratified situations. However, one piece of fine, dressed masonry was found in a context sealed by the later (17th century?) northern enclosure wall noted above. This contained a mason’s mark, hitherto unrecognized at Druminnor. Once again, sincere thanks are owed to Alex Forbes for his forbearance as yet more of his lovely policies are disturbed in the cause of archaeology, and for his words of historical wisdom and generous hospitality. NJ 5131 2642 A fifth season work was undertaken, May – October 2016, at Druminnor Castle. Highlights included the total excavation of the surviving parts of an early corndrying kiln, radiocarbon dated to between 1035 and 1207 cal AD (SUERC-67036 [GU40768] courtesy of Aberdeenshire Council Archaeology Service), from a carbonised grain of oat. Bulk samples have been sent for processing and it is hoped that a second date from this material will confirm and improve on the accuracy of the first date. The floor of the kiln contained two substantial postholes and a third that was, apparently, unused at the time of the kiln’s destruction. This structural evidence may help in understanding how the kiln was used. Trench extensions made to record more of the substantial eastern building, revealed in the previous year’s work, recorded a complicated series of stratigraphic relationships, indicative of a number of constructional phases. It is hoped that radiocarbon dating of bone from securely sealed deposits will provide dates for activity at this location. A good range of late medieval pottery has been found along with a gold reliquary cross and a small copper-alloy buckle. The former has been identified by Penny Dransart (University of Lampeter) as relating to a tradition of ‘green’ crosses, symbolically reflecting the ‘living’ wood of the cross of the crucifiction. This particular example has bark-like modelling of its surface and stylised green foliage around the top. Its hollowed stem would have permitted the carrying of a holy relic, secured in place by a removable stopper at the base of the cross. As ever, many thanks are owed to the landowner, Alex Forbes, both for his good-natured forbearance and for his wealth of local historical and Forbes family knowledge, to Aberdeenshire Council for their help in funding radiocarbon dates and sample analyses, and to AOC for their generous help and advice regarding sample collections. the environmental sampling of burnt deposits from the kiln (DES 17, 11) have contributed to a greatly enhanced picture of the local environment during the later 11th and 12th centuries at this end of Strathbogie. much fun in determining archaeological from geological deposits, especially as redeposition of upcast material has been such a feature of the site’s development. trench is, indeed, a quarry ditch for the suggested rampart. relating to the earliest recorded (thus far) four centuries of site use was quarried away, possibly in the mid-15th century, in order to provide a level platform on to which the main part of the castle, as visually-attested on 18th-century estate plans, was positioned. It is hoped that this timeframe can be confirmed by 14C analysis of bone and charcoal collected from stratified contexts. However, such analysis may well turn out to demonstrate that this platform-building phase may have begun earlier. with laminated/renewed mortar floor surfaces suggests an interest in hygiene. Use of fine Correen stone for the drain indicates that a quarry on the Correen Hills was being utilised far earlier than is usually credited. It would appear that Druminnor is demonstrating that Scottish castles of suggested 15th- or 16th-century date may well have deeper ancestries than anticipated. Also, that vast landscaping feats may well underlie many later ‘polite’ landscapes. It is unlikely that the complicated story being revealed at Druminnor is unique. Trust for the environmental analysis and to AOC for their help and advice with sampling and species identification.